My interview with the fantastically good Alex Smith, was published here, on Dec 6th, 2015, but is now fortunately available in Podcast, at his site and SoundCloud, as distinct from link only. Duly shared again in convenient form. Thank you Alex! I am also at the current Extinction Radio Show 42, Fri 08 January, 2016, interviewed by Peter Melton. Impatient listeners can go straight to my segment, at 1:14:16, here, 19:28 long. Goes to 1:33:44. And besides my segment, loyal Yoda David Korn, is the featured guest this week, with no less than a 43:32 segment, shared here (starts at 22:25 and goes to 1:05:57). If you did not know what he was like, a listen here will not leave you still wondering. David is to energy, words, and ideas that coffee is to starting a day. A kick but a good one. Trust me on this. Background from Tenney: “The main thing is that all weather now includes climate change because the atmosphere is warmer. For decades models have forecast that since the atmosphere can hold more water vapor under warmer temperatures we will have much heavier precipitation events and more intense droughts because the extra water in the air tends to clump together rather than being spread out over the planet. Today’s weather is taking place against a background of a warmer, wetter atmosphere. What we cannot say now is how much of an event is attributable to climate change, but we can certainly say that these extreme events are exacerbated by it. So we have more intense and longer-lasting droughts. Huge snowfalls. Horrible rain events. Massive floods. Worse, the rain doesn’t relieve the droughts because it falls over a shorter period of time and rushes away, either not having a chance to soak in or taking precious topsoil with it. So all weather today has an element of global warming added to it. In the U.S. Midwest, we’ve now had two 1,000-year floods in 22 years. My oldest first cousin, Mark, lives (lived) on the Meramec River in southeastern Missouri. During the enormous Mississippi River flood (and tributaries) in 1993, the Meramec River came up to the steps of his house. 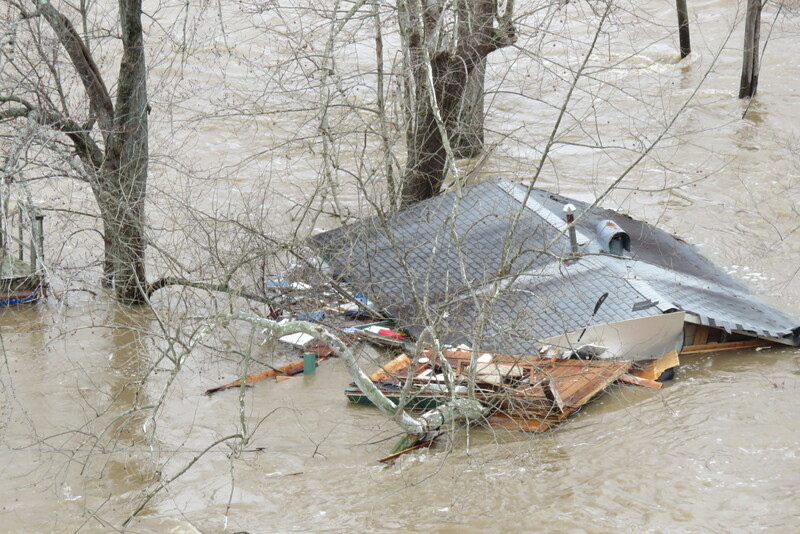 This time, it took his house down the river, and he barely got out of the area because the roads were so flooded. 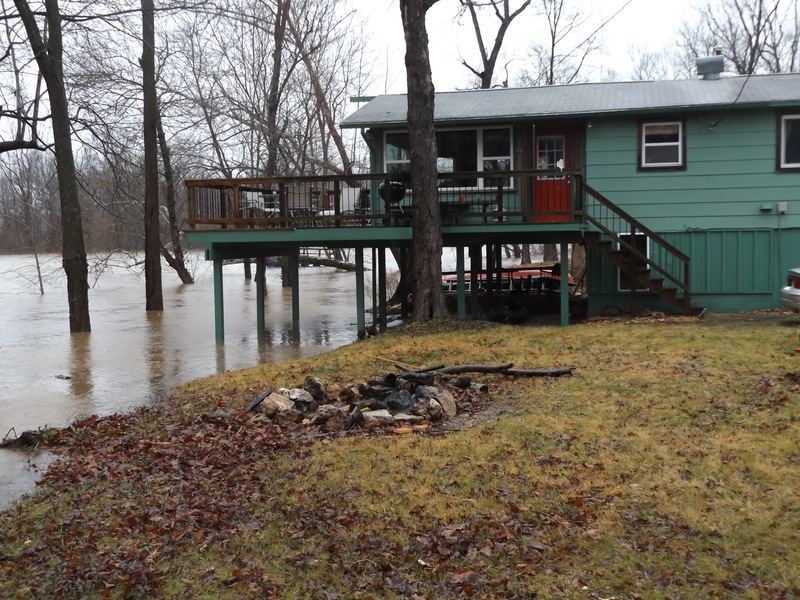 After the river took his house, it rose another 8 feet. To all my friends, It kinda looked like it might rain last Friday. It did, three inches at my home. River was rising and the creek was coming up. By noon Saturday it was drive out or stay, and I decided to ride out the storm. 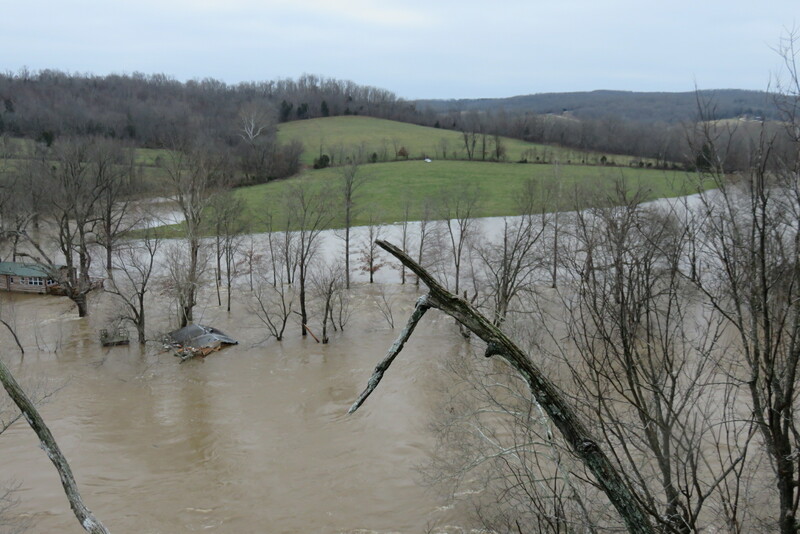 It is an amazing sight to watch the river rise, what’s the worst that could happen? I started with the basement, but it was in good shape. Then started to load my car with valuables, photo albums, etc. I put dresser drawers on top of dressers. My beloved Tempurpedic mattress as high as possible. I had a stash place in my attic where I put recording gear, microphones, stereo equipment, a few guitars and an amp, all my art work. Unless it got over three feet high in my home, I would be ok. Meanwhile I was watching the Rams play Seattle, who they soundly beat in Seattle for the first time in 10 years. Things were looking up! Darkness came and the river was still rising. It was still raining but not significantly. By 10 or 11 PM Sunday it was obvious I would have to cut through the fence and drive my car and me to safety at some time. The river was two feet up in my basement at the time. I was exhausted and hungry so at 11:30PM I stopped and ate a good meal. 30 minutes later there was 6” of water surrounding my car. I walked over to the field gate, in the flood water, and realized my car would stall out before I got to the field. I was able to drive my car the other direction to a dry spot and I cut the fence. It was time to leave. I let John know that the water was coming across the field. This meant that if he didn’t leave then he would surrounded by flood waters very soon. So I wade back to my home pack a bag with a few days of clothes, some fruit and some excellent chocolate chip cookies Glenda made for me. I was tired and dirty. I needed a shower, so I took a quick one. Rolled up my pant legs and walked through the water barefoot to my car. I drove into the field with a few heart stopping slides here and there to high ground. John saw my headlights and texted hi. That night the wind blew hard and the rain came a tumbling down. It was cold so every couple of hours I would wake up, and turn on the car to warm up. I had make sure I didn’t fall back to sleep and end up dying of carbon monoxide poisoning. With my aged bladder I would have to get out to relieve myself several times. That meant getting out in the wind, cold, and rain. Oh I was a happy camper! The sun rose and the rain kept coming down. I kind sat there stunned, tired, and cold. I waited a few hours, snoozing occasionally, sending a few texts. Fortunately I had some cell service on the hill there. The rain started slowing down. It was time to hike out. Except for one last detail. John was still there. I was telling him I was getting ready to hike out, time for him to join me. He refused. He was on an island at this time. I again implored him to leave, again he refused, so I took off hiking. Over hill over dale, light rain and wind. The road was under water for the first mile and a half. Fortunately I hike these hills often, (trespass) so I knew where I was. It took an hour and a half of vigorous hiking to go about 2 and half miles. I text John, “if I don’t hear from you in 15 minutes I am calling 911”. He responds all caps “I WILL IF I NEED TO”. Exasperated, tired and wet I rest for 30 minutes. What to do about John? Rested, I continue on my hike to safety. Another 2 1/2 miles and I make it to Carol’​s house, where she has rental cabins. She is flooded in but on high ground. I phone John. It is now about 1:30. I tell him he has about 20 minutes to make a decision to call 911. It will be getting dark soon and if he doesn’t call now there may not be time to put together a rescue. He says he will think about it. An hour later through the grapevine I hear that he did call 911 and was rescued (he didn’t give me the courtesy of a text). You can see some footage of John’s rescue at Facebook, Sullivan Independent News. So about three o’clock I go take the best hot shower of my life. Put on clean dry clothes and wander to a window to see the view. There was a leak and I stepped on wet carpet in my clean socks. Oh what cruelty life can bring. The next day the world can finally get closer and I arrange for a ride to pick me up. They have to park on the hill and I walk to them a 1/4 mile. Off we go to St. Louis. About noon driving back I get a phone call from a neighbor. They own the property on the bluff across from me. They had hiked in to survey the valley and took some pictures. They had some bad news. My home was gone. I want every one to know that I am in good spirits, considering. I am warm safe and dry. I won’t have to busy myself hosing down and cleaning up after the flood as I have done many times before. I did have flood insurance for my house, not possessions, so I am not financially battered too bad. I will rebuild. If I can still get flood insurance, (a big if since they paid out $35,000 8 years ago) I will rebuild a new castle. If I can’t, I will rebuild something more modest. Either way the 31st annual 4th of July Party is still on! So today I will go buy some clothes. Not too many, I don’t have any place to put them. I will go back in a few days to get my car. I will have one of my many river friends take me in their jet boat down river a 1/2 mile to a log jam where the river deposits it’s​ newest possessions. Hopefully I can find a few mementos. I plan on taking my annual winter Florida holiday early this year, like starting next week. If you try to call me or text me, please be patient if I don’t get back to you right away. I know you all care for me and wish to be helpful. At this time I am still sorting things out. Mark of the Meramec // There has been some confusion regarding the last photos. What you see is my roof in my neighbor’​s yard. There is no house under it. This entry was posted in News, Podcasts, Rapid Climate Change, Uncategorized, Videos and tagged Alex Smith, David Korn, Extinction Radio, Paris COP 21, Peter Melton, Podcasts, Radio Ecoshock, z Meramec River Floods. Bookmark the permalink.